Albert Bates is the author of 14 books including The Biochar Solution: Carbon Farming and Climate Change, The Post Petroleum Survival Guide and Cookbook, and Climate in Crisis: The Greenhouse Effect and What We Can Do. He is the cofounder of three organizations, including Global Village Institute for Appropriate Technology (which he has headed for 35 years); the Ecovillage Network of the Americas, and the Global Ecovillage Network. GVI channels resources to forward-looking social movements worldwide, including a peace-through-permaculture project in Israel and Palestine, a municipal landfill arts project in Mexico, and the Sail Transport Network, moving fair trade goods along coastal routes. Albert appears frequently as a public speaker, commentator and on podcasts, and is a regular blogger and tweeter. Ran Bar Yoshafat is the former Israeli national champion for mixed martial arts and an attorney. His volunteer activities include outreach with disabled children, environmental cleanup projects, and renovating low-income housing. Chief Justice Walter (Bud) Carpeneti received his undergraduate degree in history from Stanford University and his J.D. from the UC Berkeley School of Law. Following a stint as law clerk for Alaska justices Dimond and Rabinowitz, he worked in private practice in San Francisco for several years before returning to Alaska to serve as a public defender. Governor Jay Hammond appointed Carpeneti to the Alaska Superior Court in 1981. While on the Superior Court, he was a member of the Alaska Commission on Judicial Conduct and of the Three-Judge Sentencing Panel. He was also Chair of the Supreme Court's Criminal Sentencing Practices and Procedures Committee. In 1998, Governor Tony Knowles appointed him to the state's Supreme Court. While on the Supreme Court, he chaired its Judicial Education Committee. The other justices named him Chief Justice in 2009. He is of Italian extraction, and maintains strong ties with the nation about which he spoke. T.R. Reid has become one of the nation's best-known reporters through his books and articles, his documentary films, his reporting for the Washington Post, and his light-hearted commentaries on NPR's Morning Edition. His latest film on the U.S. healthcare system will be aired on Alaska public TV in the 3rd week of March while he is in Juneau. In his movie, he travels the country to find high-quality health care at costs way below the national average. Some famous medical providers (such as Group Health in Seattle, and the Mayo Clinic) turn out to charge less than their peers for treating the same ailments. He discussed his latest film with us at UAS. Former JWAC board member Elfrida Nord shared fun photos and stories of her experiences from a 2011 visit to this re-emerging Southeast Asian country. We were joined this weekend for a presentation by Mark Begich on his visit to Afghanistan in January. Senator Begich is a member of both the Armed Services Committee and Veterans’ Affairs Committee. During his journey he visited Kabul and Camp Bastion, and toured Helmand and Kandahar provinces -where many Alaska soldiers are based. WorldQuest is JWAC's largest fundraiser, featuring an international buffet, no-host bar, silent auctions, and our delightfully amusing trivia contest with emcees Sharon Gaiptman and Dennis Egan. This year's winner was team Uz-beki-beki-beki-stan-stan (which is going to be hard to fit on the trophy). We had 22 teams and for the first time ever, sold out! Thank you everyone for comming out to support JWAC. From Saint Petersburg (the "Venice of Russia") to Moscow (the seat of centralized power), Kurt and Bev Smith traveled the rivers and ancient connecting canals of western Russia's waterways by riverboat. They showed photos of the bustling cities, rural communities, palaces, cathedrals, art, and scenes along the river including the locks negotiated en route. Mr. Persily has been the Federal Coordinator for Alaska Natural Gas Transportation Projects since appointment in 2009 by President Obama. Prior to taking the post, he had worked as editor of the Juneau Empire, the Anchorage Daily News, and the Wrangell Sentinel; and he was Deputy Commissioner of Revenue during the Knowles Administration. He was also on top lobbyist John Katz's staff in the Washington D.C. Governor's Office. We gathered Monday at noon for this special brownbag lunch presentation by Governor Sean Parnell upon his return from the state’s first trade mission to Europe and the Middle East. Wednesday, Nov. 30th | After the Travelogue | JACC | It's a potluck! Bring something scrumptious! JWAC's Annual Meeting occurs every November, and is the time when we gather to make goals, prioritize, and elect new board members (interested? Send us an e-mail!). Wednesday, Nov. 30th | 6:00 | JACC | Bring lots of food so there's enough for everyone! Before the short Annual Meeting and after the potluck, folks joined us to be regaled with tales of Margo Waring and Doug Mertz's recent travels in Turkey. This year's Fall Forum was a big one, and covered an issue that's close to home for all Alaskans. Click here to see the schedule and learn about 2011's speaker panel. 'Neither Easy Nor Quick: Doing the right thing for Israel, Palestine and America' with Ambassador Edward Peck. Ambassador Edward Peck is a retired career United States diplomat who served thirty-two-years in the U.S. Foreign Service. He served as Chief of Mission in Baghdad from 1977 to 1980, and later held senior posts both in Washington and abroad. He also served as a Foreign Service Officer in Morocco, Algeria, Tunisia and Egypt, and as Ambassador in Mauritania. He served as deputy director of the White House Task Force on Terrorism for the Reagan Administration. He is president of Foreign Services International, a consulting firm that works with governments, businesses and educational institutions across the world. Ambassador Peck argued against invading Iraq prior to the March 2003 invasion. He argued, in part, "when you take out Saddam Hussein, the key question you have to ask then is, what happens after that? And we don't have a clue. Nobody knows, but it's probably going to be bad. And a lot of people are going to be very upset about that, because it really is not written into our role in this world to decide who rules Iraq." Deborah & Phil Smith, and Susan Baxter & Dave Sturdevant presented the first travelogue of the season, a slide show on their journey by train in late winter 2010 from Amsterdam to Beijing. The focus was the 7-day passage on the Trans-Siberian Express from Moscow across eastern Russia and Mongolia. They sure met some exciting characters along the way. 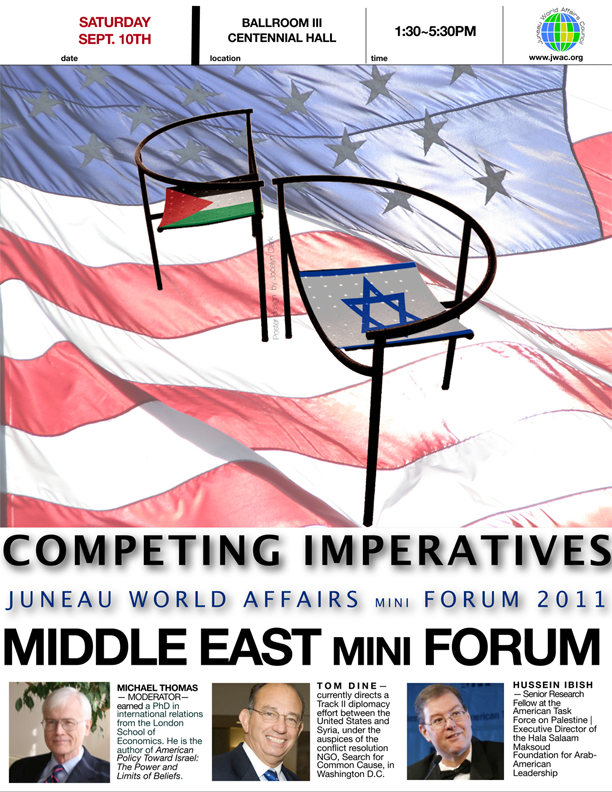 Our first ever Mini Forum served as a review and update from our 2009 'Fall Forum on the Middle East.' Our panel included Hussein Ibish and Thomas Dine, and was moderated by Michael Thomas. Click here for the schedule and to read about the speaker panel. Peter Kenyon is an award-winning foreign correspondent for National Public Radio based in Istanbul. He is covering Iran’s ongoing political crisis as well as the business of Persian Gulf oil and its international influences. Prior to taking this assignment in 2010, Kenyon spent five years in Cairo covering Middle Eastern and North African countries from Syria to Morocco. From 2001 to 2005, He was based in Jerusalem and covered the Israeli-Palestinian conflict. In addition to regular stints in Iraq, he has followed stories to Yemen, Saudi Arabia, Syria, Lebanon, Bahrain, Qatar, Algeria, Morocco and other countries in the region. Kenyon came to NPR in 1995 from the Alaska Public Radio Network. He began his public radio career in Petersburg, where he met his wife Nevette, a commercial fisherwoman.